It is that time of year. Classes are over. Campus is emptying. Soon it will be mostly emptiness, snow, and grad students (who of course never leave). I like to take some time to reflect on the course. How did it go? What went well and what didn’t work out? And now that all the numbers are in, we can examine course trends and data. Since numbers are direct and graphs are pretty, let’s look at the numbers first. 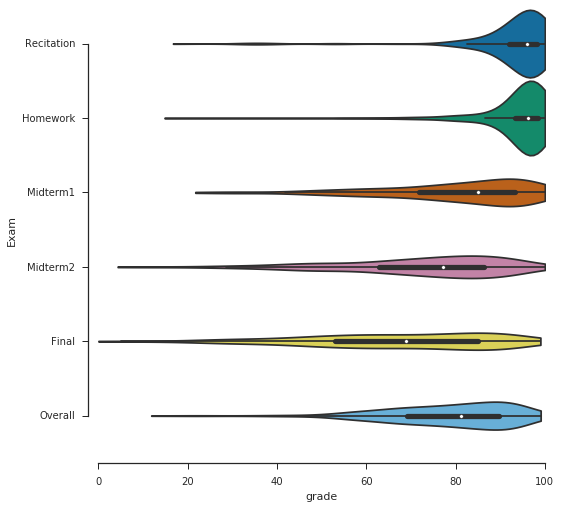 Let’s get an understanding of the distribution of grades in the course, all at once. 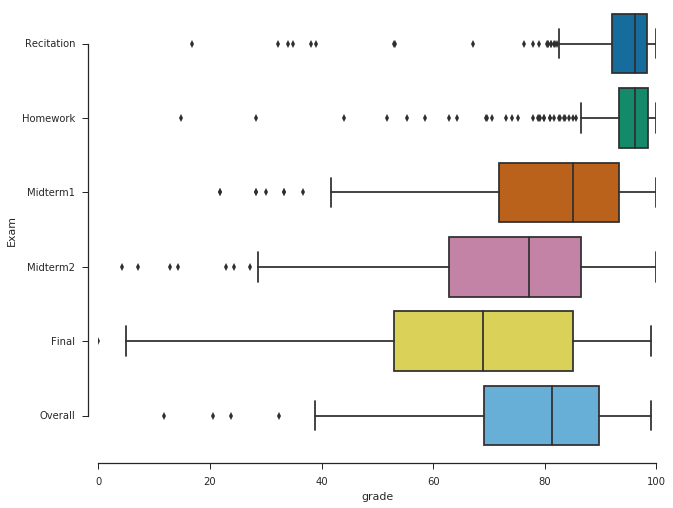 These are classic box plots. The center line of each box denotes the median. The left and right ends of the box indicate the 1st and 3rd quartiles. As a quick reminder, the 1st quartile is the point where 25% of students received that grade or lower. The 3rd quartile is the point where 75% of students received that grade or lower. So within each box lies 50% of the course. Each box has two arms (or “whiskers”) extending out, indicating the other grades of students. Points that are plotted separately are statistical outliers, which means that they are $1.5 \cdot (Q_3 – Q_1)$ higher than $Q_3$ or lower than $Q_1$ (where $Q_1$ denotes the first quartile and $Q_3$ indicates the third quartile). A bit more information about the distribution itself can be seen in the following graph. Within each blob, you’ll notice an embedded box-and-whisker graph. The white dots indicate the medians, and the thicker black parts indicate the central 50% of the grade. The width of the colored blobs roughly indicate how many students scored within that region. [As an aside, each blob actually has the same area, so the area is a meaningful data point].